An important source of vitamins and minerals, passion fruit is found in many parts of the world. It is a type of berry typically purple or yellow in color, depending on the plant species. The passion fruit juice is fragrantly aromatic and tart in taste. Owing to its sweet aroma, it is usually mixed with other fruit juices or consumed along with other whole fruits like grapes, bananas, and sweet lime. 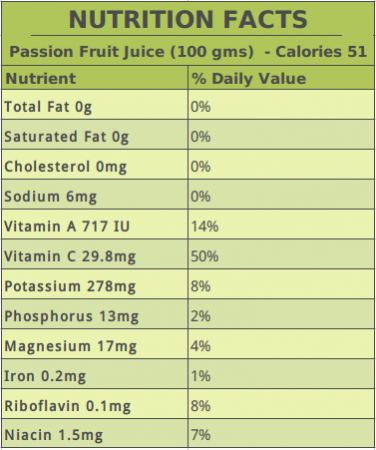 Passion fruit juice is packed with a lot of goodness. It is very low in terms of saturated fats, cholesterol, and sodium, which makes it good for those having heart disease and cardiovascular disorders. The nutrients are primarily vitamins A and C and minerals such as potassium, phosphorus, magnesium, an iron. It also contains members of the vitamin B group such as riboflavin and niacin, which help improve the absorption of food. The potassium in the juice also helps improve the metabolic rate, enhances muscle strength, and gives the nervous system a good boost. This fruit contains plant-based iron, which is not so well absorbed otherwise, but since passion fruit has high amounts of vitamin C, the absorption of iron becomes easier. To fight any disease and to maintain your health, vitamin C is essential. Passion fruit juice is a great source of vitamin C, and it stimulates the production of white blood cells, which boosts immunity and helps fight diseases. This is just one of the many benefits of vitamin C.
Being an excellent source of vitamin A and vitamin B2, passion fruit improves cardiovascular function and lowers the chances of heart attack and stroke. Passion fruit has high levels of potassium, which works as a diuretic and helps manage blood pressure. It acts as a coolant and balances the pH. It reduces inflammation in the gut and other painful conditions affecting the digestive tract. With a good amount of dietary fiber, passion fruit improves digestion and the overall metabolism. With abundant quantities of vitamin A and vitamin C, this juice helps reduce oxidative stress, preventing beta-amyloid deposition and lowering the risk of dementia, Alzheimer’s, and other neurodegenerative diseases. If taken in moderation, this nutrient-dense juice can help you reduce weight as it improves metabolism and also makes you feel full because of its fiber content. With rich amounts of iron, phosphorus, potassium, and copper, it strengthens your bones and lowers the risk of osteoporosis. Passion fruit juice is rich in vitamins and has numerous health benefits. Including it in your daily diet could prove beneficial. Check out the passion fruit juice recipe. It is simple and can be made within a few minutes. Cut all the passion fruits in half and scoop out the seeds. Add all of this to a blender with three cups of water and blend gently. This juice tastes best when served chilled. Keeping the seeds intact is suggested, although it would change the consistency of the juice (unless you want to use it for a mocktail). If you want to consume passion fruit juice as part of your everyday diet, do not sieve the seeds. Pulp and juice prepared in this way can be preserved for months if packed into serving-sized cups and covered with cling wrap or aluminum foil and frozen in the freezer. Remove the cups from the freezer and thaw them overnight in the refrigerator based on your requirements. However, we would always recommend having freshly blended juice or actually eating the whole fruit. You can add sugar, but again, we would not recommend that. You can opt for a natural sugar substitute if you want, or mix it with other juices. You can have this in the morning along with breakfast. A substitute for the usual purple passion fruit is a yellow passion fruit, also called lilikoi. Though slightly larger than the passion fruit, with a bright yellow skin, the taste and sweetness is just as good as its purple counterpart. Another option is the commonly found pineapple. The taste is on the sour side but will work perfectly well in juices, punches, or drinks that feature passion fruit juice. 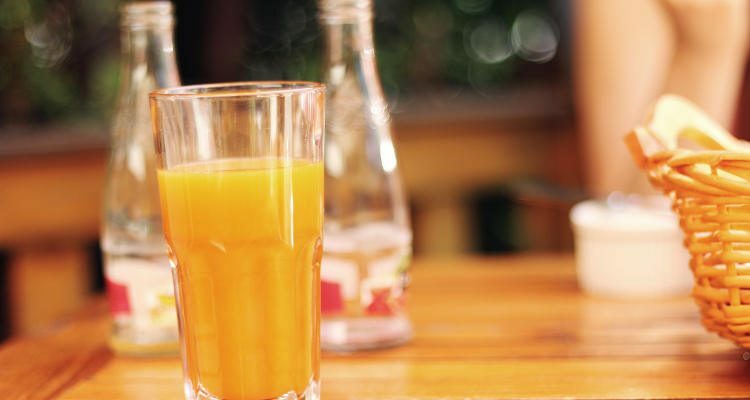 Passion fruit juice makes a healthy drink that can be consumed for breakfast or even as a cool refresher on a hot, sunny afternoon. It even forms a great base for an evening cocktail that can be enjoyed with dark rum, vodka, or gin. All inclusive, this fruit juice has a number of uses and how to use it is a choice of our own.